Mobile Cloud Computing is the Next Step of Enterprise Cloud computing. People using Mobile Cloud Computing as an alternative to traditional cloud computing. Cloud computing on mobile gives extra flexibility. It is a means of transferring data from the mobile device to cloud storage. Technology is now available. So people feel interested to go for any data where concept. As a result, mobile cloud computing is now very popular. Mobile Cloud computing means integration of mobile device, internet, and cloud platform together. Mobile is used at the client end. The cloud service provider offers a mobile application as a tool for cloud computing. The mobile device sends a request and cloud execute. It is nothing but integration with the mobile device. Normally it uses pay as you use principle. Mobile computing devices successfully eliminate paperwork. It transfer, collect and store data electronically. Field mobility is the key feature of the mobile cloud. Some major examples are barcode scanners, mobile printers, etc. It reduces the burden of the written invoice. Those increase employees efficiency. Mobile cloud provides productive output in less time. It improves faster access information. Critical information update is possible in real time. As a result of the efficacy of the organization increase. An increase in individual productivity is accumulated efficiency. Mobile cloud reduces the mobility of an employee. So labor cost decreases. It enables data anywhere concept. Real-time contact with critical information helps to take decision instantly. The major potential areas are inventory management and bus ticketing system. Every user is well aware because of cloud mobile. Customers are the second god of business. If you provide support to customer live, their satisfaction will be up. It will enable the service faster. Customer will get more satisfaction and your brand will get popularity. Mobile clouding is basically used in sales management, Customer Relationship Management, and Supply chain management. It needs life data update. In the manual process, it may occur a mistake. So mobile cloud computing increase efficacy and bring greater accuracy. A mobile battery has limited time charge. So uncompleted request is very much common. But now technological advancement solves this problem. WiFi Charger, mobile power bank can solve the problem. Moreover, cloud mobile application consumes more power. Internet connectivity is another challenge of the mobile cloud. All the location is not supported by GPRS and CDMA. Fall of mobile internet connection can create an unusual request. The cost of mobile internet is much higher. The wireless network is designed for transmitting cloud computing. So it has its own inherent nature and constraints. These problems confuse their design for mobile devices. Even more in an evaluation of the desktop cloud computing. Desktop/laptop broadband is sustained by consistent network bandwidth. Wireless connectivity is categorized by less throughput, longer latency, and variable data rates and intermittent connectivity due to gaps in coverage. User mobility and uncertain factors like weather are also accountable for low bandwidth capacity and coverage. To implement mobile cloud computing to mobile devices elementary prerequisite is to have access to the network. In a mobile cloud world, there is a mixed access scenario with different access technologies. Some are 3G, GPRS, WiMAX, WLAN and so on. Each one with their own offerings, schemes, policies, and restrictions. Due to the presence of dissimilar other schemes, we need unified connection handover schemes. This will avoid connection reestablishment and connection failure. When the transfer from one network access point to another network access point. The speedy mobile internet is not available everywhere. So the disruption of mobile cloud data transfer is common. As a result, the actual result is not possible in real time. Decision making becomes a delay. The uncommon network device creates another problem. It the algorithm of all device is not the same synchronization becomes difficult. Bandwidth is another challenging issue for mobile cloud. High bandwidth brings high efficiency. Business leaders should consider cloud bandwidth. Establishments that follow BYOD policy (Bring-your-Own-Mobile) normally face interoperability challenges. A group of people sharing network and using including iPhone, Android phones and BlackBerry. The employee may be the victim of pushing data across multiple devices. Very often we can see the mobile cloud is not flexible. Sometimes it is less flexible than the desktop application. It is one of the challenges of mobile cloud computing. The function of both laptop/desktop cloud computing and mobile cloud computing is not the same. The area of mobile cloud computing is limited. It can be only substituted. Hard tasks like video indexing and speech recognition are ported to the cloud exit less severe tasks to still be executed on the phone itself. Jobs that are not required to perform instantly like indexing files or virus checking. That’s are enthused to the cloud. So it is giving more space for primary activities. Consumers can pick an exact application to be run in an augmented manner over the cloud. This saves the mechanisms of the program whole but changes the method of its execution. A computer-generated clone of the mobile software is formed on the cloud. It altered to care high-level applications before beyond its computational capability. Several virtual clones of the device software are made to speed up the implementation. This can help cloud applications which require rigorous parallel processing. In spite of having all challenges, mobile cloud computing is going to create an enterprise cloud. The combination of all little device makes a big one. 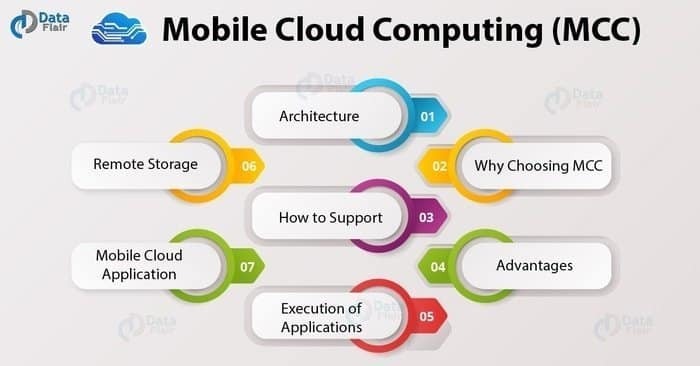 The different cloud service provider offers different application of mobile cloud computing service. Some example is: AWS, Dropbox mobile, google drive mobile version, different CRM and ticketing software, etc. Now the time to play with big data. Many enterprises are using a mobile cloud. Especially the organization who need real-time live data they use mobile cloud computing.